Palestinian movement Hamas has condemned the death sentences meted out by an Egyptian court on Saturday to a number of its members in two criminal cases on Saturday as "unfortunate and shocking." Cairo Criminal Court handed ousted president Mohamed Morsi and 105 others, including a number of Hamas members, provisional death sentences for charges of committing murder, attempted murder, looting prison weapons, releasing prisoners, and damaging buildings during their escape from an Egyptian prison during the early days of the 2011 revolution. Prosecutors had argued that over 800 fighters from Gaza had infiltrated Egypt, using RPGs and heavy weapons to storm three prisons, abducting four policemen and killing several others, along with inmates. Hamas spokesman Sami Abu-Zuhri said in a statement on Saturday that the verdict was based on "false information”, saying that some of those Hamas members who were convicted in absentia, including “martyrs Tayseer Abu-Senema and Hossam El-Sanea,” were dead at the time the offences were carried out. Abu-Zuhri said that others convicted have been in the "prisons of the occupation (Israel) for years, such as Hassan Salama, who has been imprisoned for 19 years." The death sentences have been sent to the country's grand mufti, as per Egyptian law, for review. The mufti's advice regarding the penalty is non-binding. The court will issue its final verdict on 2 June, although the verdict can be appealed. Also on Saturday, the same court handed out 16 death sentences to Egyptians in a separate case dubbed the "Hamas Espionage Case." In the case, prosecutors had charged Morsi and 35 others with conspiring with foreign powers — including Hamas, Lebanon's Hezbollah and Iran's Revolutionary Guard — to destabilise Egypt. 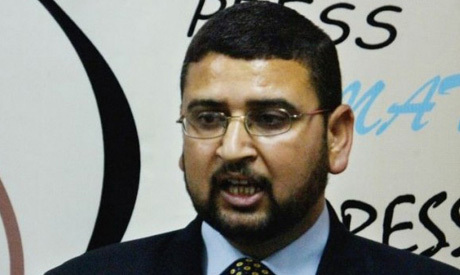 Hamas is a sister organisation of the now-banned Muslim Brotherhood, from which Mohamed Morsi hails. Following the ouster of Morsi in July 2013, the relationship between Egypt and Hamas soured. Two Cairo court verdicts in January and February declared the group’s military wing Al-Qassam Brigades as well as Hamas itself to be terrorist organisations. Shortly after, Egypt's government challenged the verdict against Hamas, and the lawyer who filed the case withdrew it. However, the verdict against Al-Qassam remains in place. Cairo has also accused Hamas of meddling in its internal affairs and supporting Islamist insurgents in Sinai, accusations that Hamas strongly denies. The terrorist from Gaza should be tried in military tribune instead. He can face death by shooting. Tahya Misr. Peace will happen if Arab Jews are empowered and became decision makers. God did not promise the blue -eye, Euro-Zionists by the promised land. Whose land-Whose Promise? Egyptian Gaza is a 1.5 Pals refugee camp; not a nation. In return, Hamas threatened our national security by orders from Iran. Euro-Zionists refusal to peaceful settlement has caused all of these problems.